Cyril, the cellar master, presents their natural sparkling Vouvray, made with just the natural sugars in the grapes. It is unlabelled and sealed with a crown cap because it's only been bottled and undergoing its secondary fermentation for a few weeks. It is too young to sell, but it was already very drinkable. As anyone who reads the blog will know, Chateau Gaudrelle is our favourite winery. We take clients there a lot, and last week they held a networking event to which hotels and tour operators who work with them were invited. Marie opens up the amuses bouches, which were both beautiful and delicious, from an outside caterer. 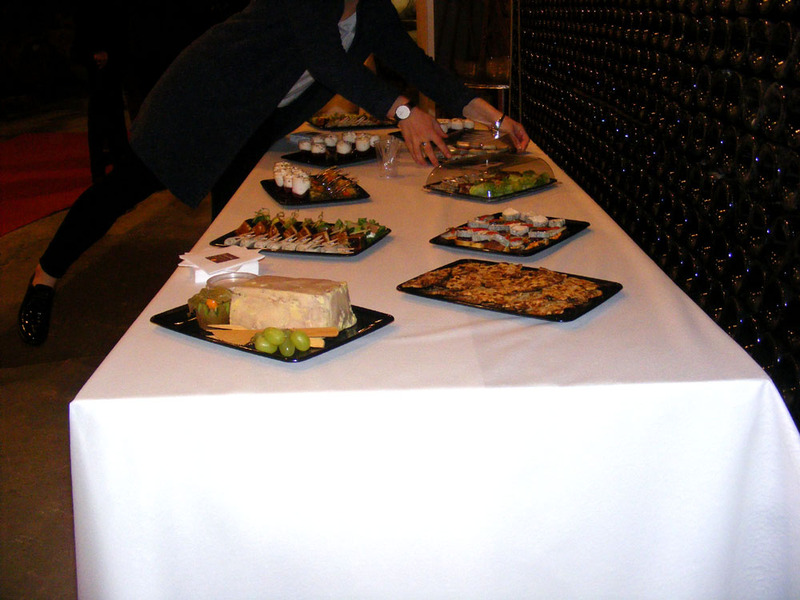 The foie gras at the front left was particularly popular, and earned the approval of someone who had grown up in the south-west, where most foie gras is produced. 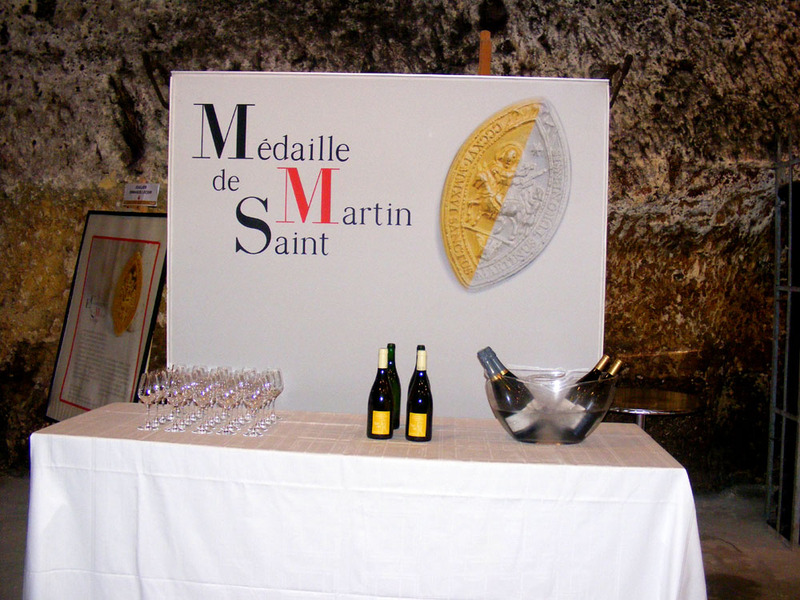 They presented the latest wines and their new labels. The old labels were classic, but confusing for the customers because although the corporate imagery was strong it was difficult to distinguish between the different wines in their range just by looking at the bottle. With the old labels the one on the front was identical, and it was only when you turned the bottle around and read the back label that you could tell what it was. So now each of the wines has its own colour for the label and they are named after the parcels the grapes come from, instead of for the style of wine. The medaille Saint Martin is a limited edition pin in silver or gold produced by a local jeweller. 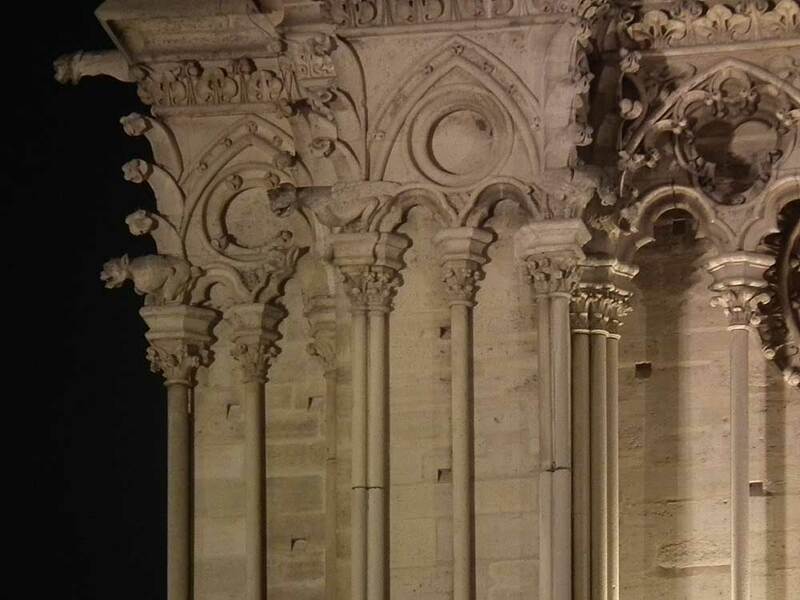 Proceeds from the sale of the brooch go to various heritage projects (at the moment the restoration of the Basilica Saint Martin in Tours). French Presidential Campaign: I posted my assessment of the campaign and candidates so far on Facebook. You can read it here if you are interested (you will need to log in to FB). The top right hand (or for those less geographically gifted, the north-eastern) corner of the Paris tramline T3b gets quite interesting. 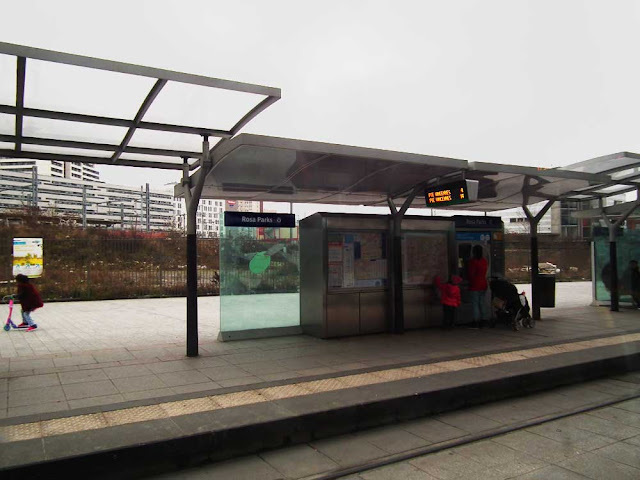 Although the area isn't the most picturesque (it strays outside the Périphérique for a while, and then along the edge of a big redevelopment zone), the names of the tram stops are a pleasant surprise. 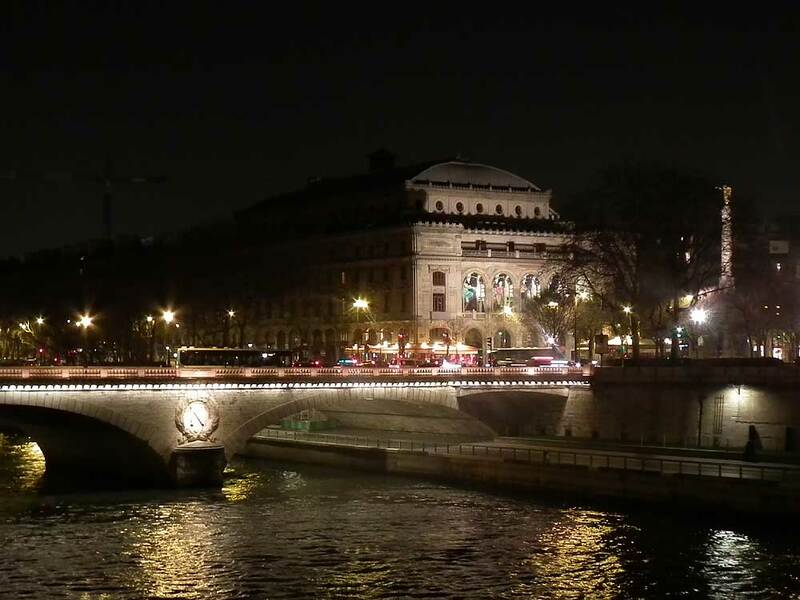 I was a little saddened to see there isn't a bus interchange (I was hoping for extra irony in the photo), but there is a swimming pool near Colette Besson, a cinema at Delphine Seyrig, and a concert hall near Ella Fitzgerald. 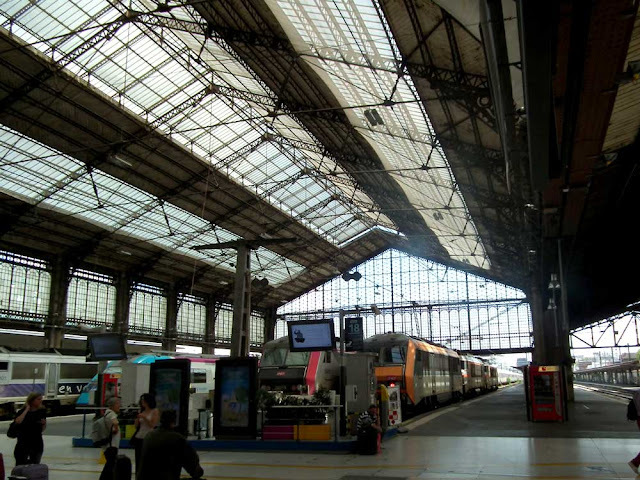 The past few days I have written about stuff to do at Paris Austerlitz station. 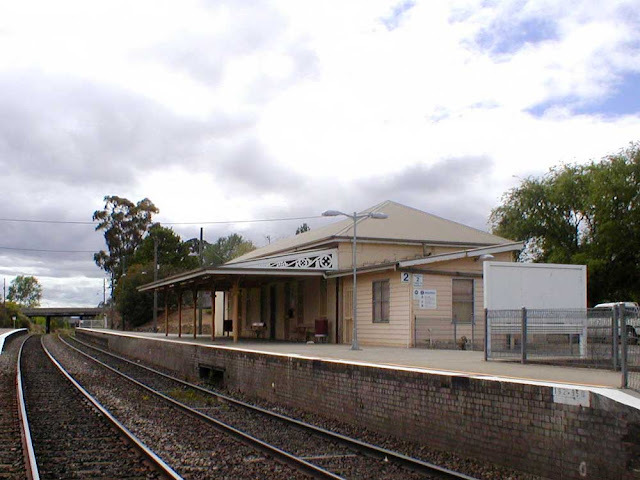 No such luck at Marulen station southwest of Sydney. I wrote the other day about the short story machine at Paris Austerlitz station. This is by no means the only diversion to fill in your wait. If you have time you can take a little wander and look at the building itself (quite ace, actually) and its surrounds. Trains, Cranes and Automobiles (and a boat). I love the way the metro station is attached. re-imagined renaissance heroes by Sacha Goldberger. 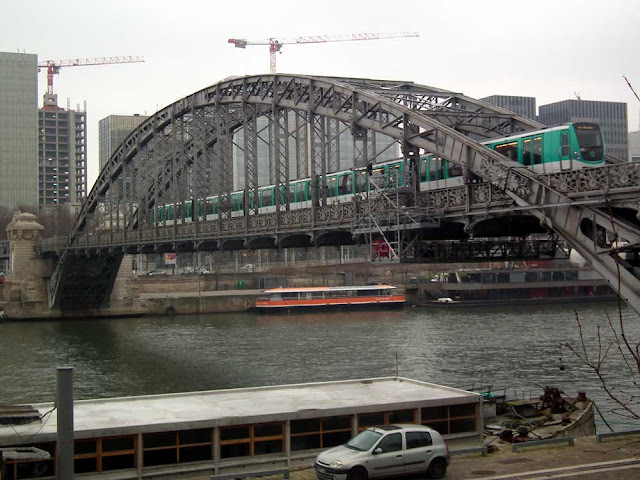 A panoramic composite view of the 15th arrondissement from the Petite ceinture. One of the many info boards along the track. 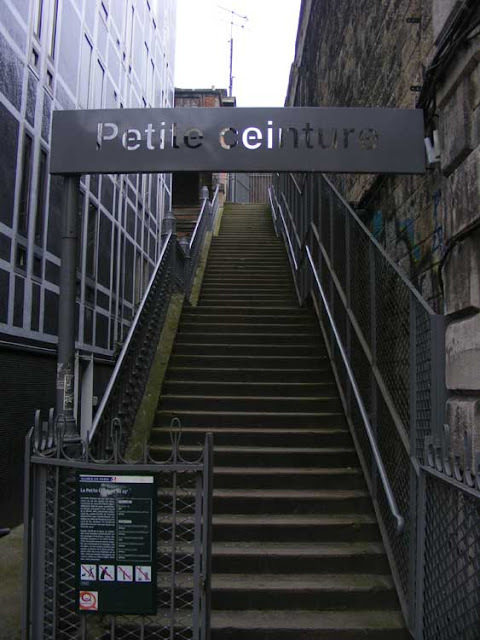 So when we went to Paris in early February one of the attractions of the apartment we rented in the 15th was that it overlooked the 1.5km section of the Petite ceinture in this arrondissement. This part has been developed by the local authority to form a walking path and long skinny nature reserve. Left for 25 years to become overgrown it became a wildlife haven, a corridor for foxes, hedgehogs, birds and bumble bees. The new path, incorporating the old rails. The section through the 15th is the most gentrified. It's used by joggers and dog walkers primarily. It has lifts from street level up to the old track bed at regular intervals, benches made from 'sleepers', and decking 'platforms'. A generous path was formed by packing the track with hoggin so that there was a level walking track but the rails are still visible, integrated into the path. The lift in front of our apartment, taken from the apartment window. All along the track are information boards describing the wildlife you might encounter at that spot. One of the most impressive is a tall dead tree, sprouting honey fungus out the top, nicknamed la Chandelle ('the candle'). The info board explains the tree has been left there for large wood boring beetles. The entrance to one end of the section of the Petite ceinture that runs through the 15th. Constructed around Paris under the Second Empire (1852 - 1869) this railway line transported passengers up to 1934 and goods up to the end of the 70s. 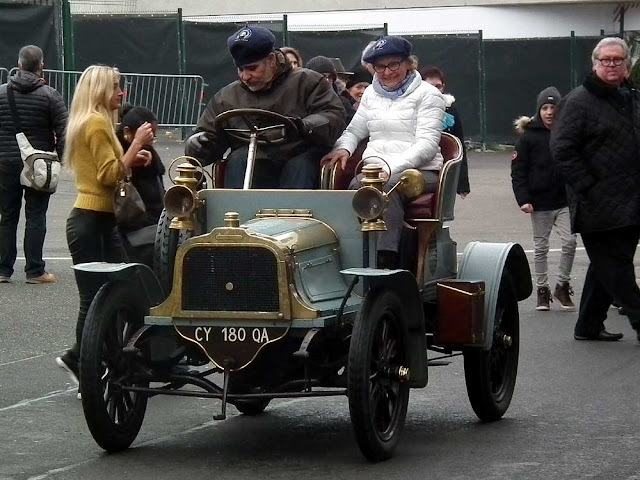 In the 15th arrondissement, it particularly served the Citroën factory and the abbatoirs of Vaugirard. Since then the vegetation has spontaneously appeared on the banks, ballast, bridges and walls, forming different strata where numerous animal species can live. 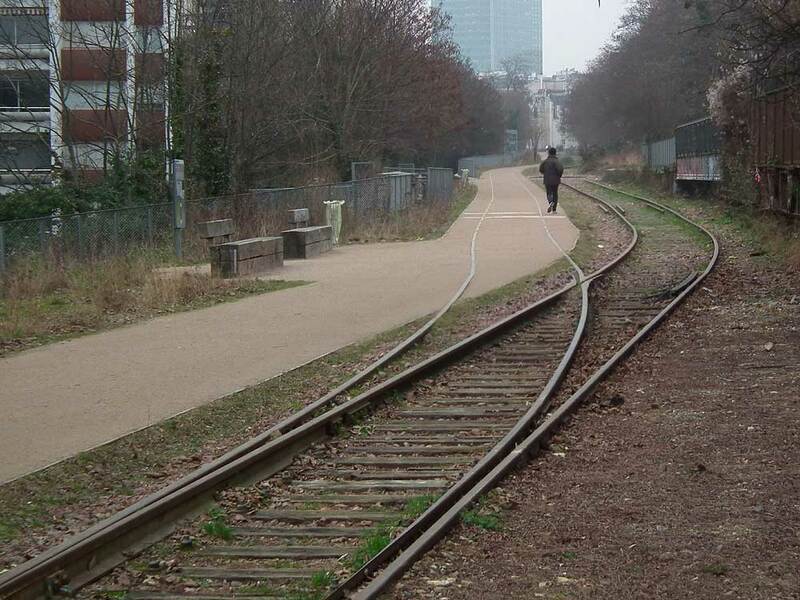 To allow public access to the site the City of Paris has landscaped it whilst preserving the railway heritage and improved the unique biodiversity. 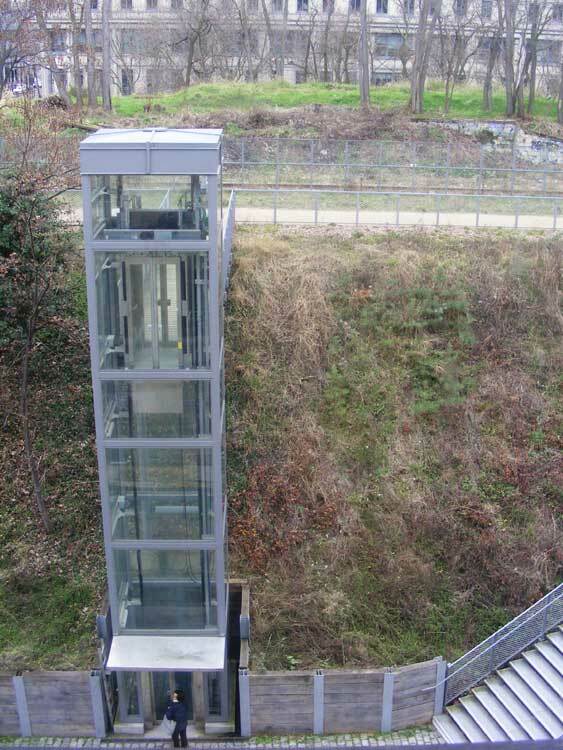 The trail is reversible in case of occasional rail usage. 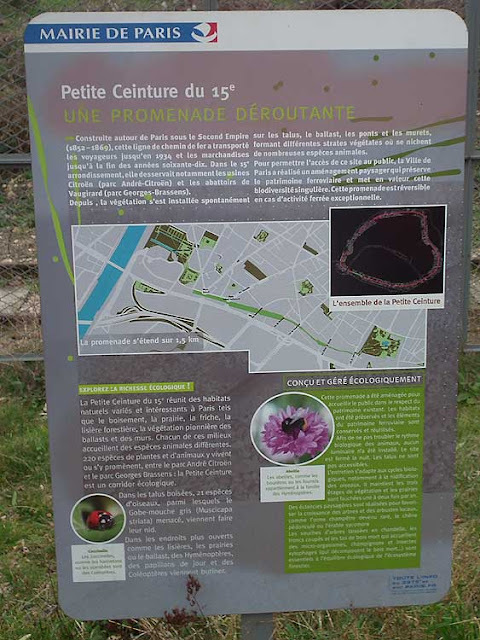 The Petite ceinture in the 15th brings together varied and interesting natural habitats in Paris such as woodland, grassland, wasteland, woodland edge and vegetation colonising the ballast and walls. Each of these environments harbours different animal species. Two hundred and twenty species of plants and animals live here or use it as an ecological corridor between the Parc André Citroën and the Parc Georges Brassens. Along the wooded slopes 21 species of birds nest, amongst them the threatened Spotted Flycatcher Muscicarpa striata (Fr. Gobe-mouche gris). In the more open areas like the woodland edges, the grassland and the ballast, bees, wasps, butterflies and beetles come to nectar. This walking trail was developed so that the public could use it whilst respecting the existing natural heritage. 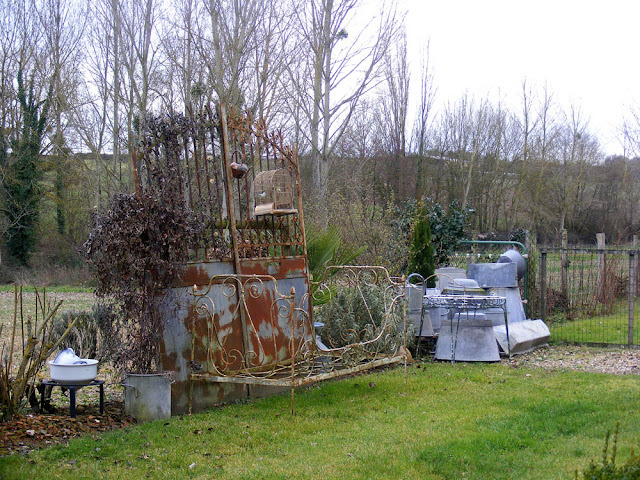 The habitats have been preserved and elements of the railway heritage have been conserved and reused. Finally, in order not to disrupt the lives of the wildlife, no lights have been installed, and the site is closed at night. The banks are not accessible. Maintenance is timed so that it does not disturb wildlife, particularly nesting birds. The idea is to maintain three stages of vegetation, and the grassland is mown once or twice a year. Woodland clearings are created to encourage the growth of local trees and shrubs, such as Field Elm, which is becoming rare, or English Oak and Sycamore. The trunks of dead trees and piles of wood are left as habitat for micro-organisms, fungi and wood boring insects. These all work to decompose dead wood and are essential for maintaining the ecological balance in a forest ecosystem. I am not sure if they are identical, but I do know where they are. 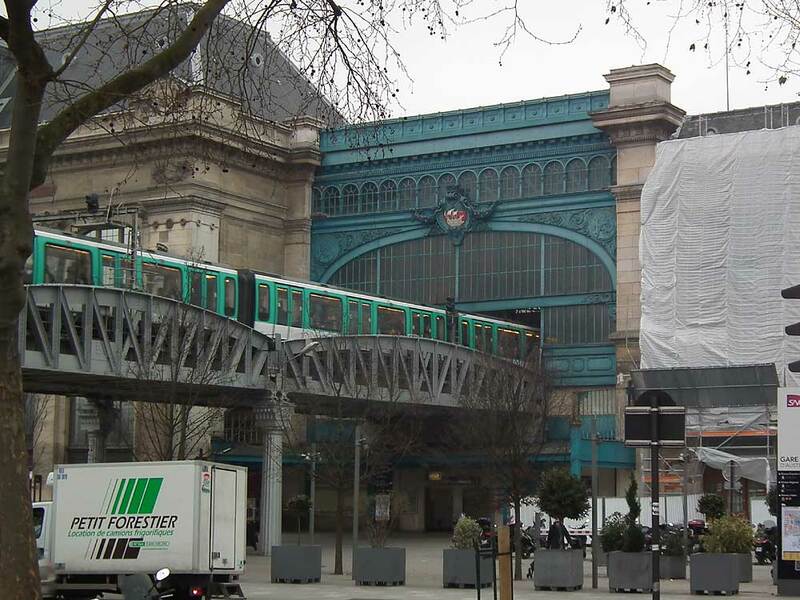 If you're on Paris Austerlitz Station (and most likely some others) with time before your train, SNCF have installed some diversions. 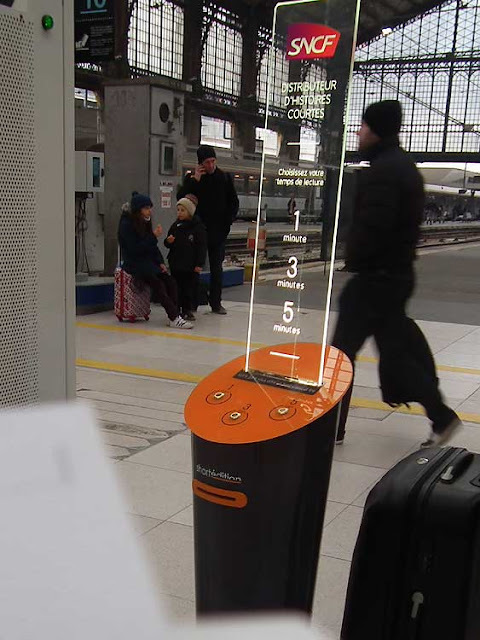 Not only do they have a piano (like this one, in Paris Montparnasse station), they also have a short story dispensing machine. Its free, and easy to use - all you need to do is decide how long you want to be reading for and press the corresponding button. I decided that as I had 30 minutes a 5 minute story in French would be more than enough, so pressed that button. 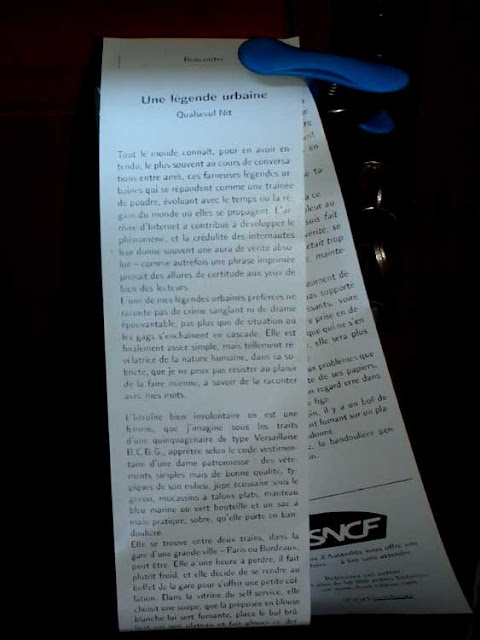 Your story comes out printed on what looks like a high quality cash register roll, a metre (3') long. You will need your reading glasses. When we were in Paris the other week I convinced Susan (and myself) that as we had Mobilis passes for the Metro we should go out after dinner and look at a sight. Usually we're not very good at that - in winter, after dinner, one hunkers down in the warm and listens to the radio. We are glad we went out though. It was very cold, with a chill wind, but the clearest from fog the whole of the 4 days we were there. It made for some amazing photos. 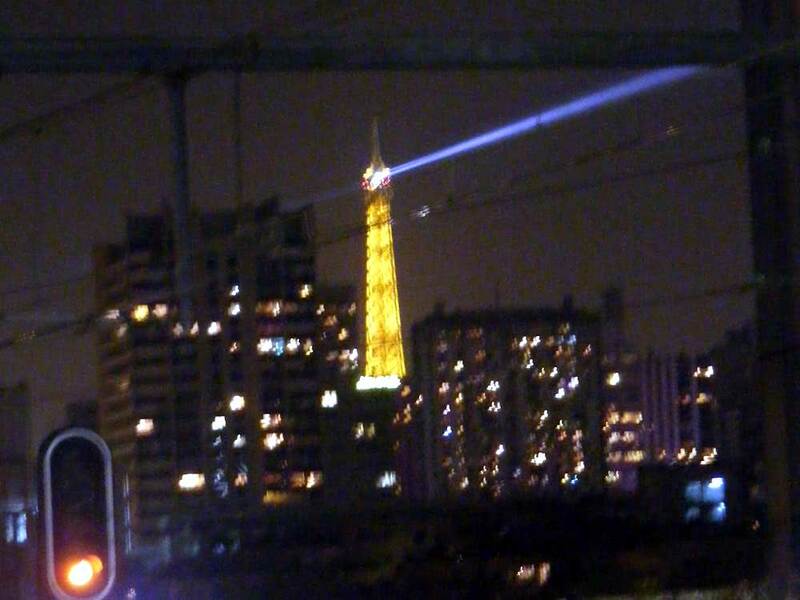 Next time we are in Paris we will have to go out at night again - it was rather pleasant to do something different. While we were away in Paris a tall ruggedly handsome man in his early 60s came to town and held a public meeting in Chaumussay. He was the Occitan (Basque) member of parliament Jean Lassalle and he was on the campaign trail. He is known in France for travelling round the country and meeting ordinary people, but he also needs to get the signatures of 500 mayors to validate his canditature for president. In addition he was touring to promote his new book, Un Berger à l'Elysée, which is basically his manifesto. As well as being the deputy chairman on the conseil général and a deputé in the national parliament, he has been mayor of his birth place, Lourdios-Ichère, for decades. The small town, population 146, is near the border with Spain. He is also the head of the World Mountain People Association, a global network of people who live in the mountains of more than 70 countries. 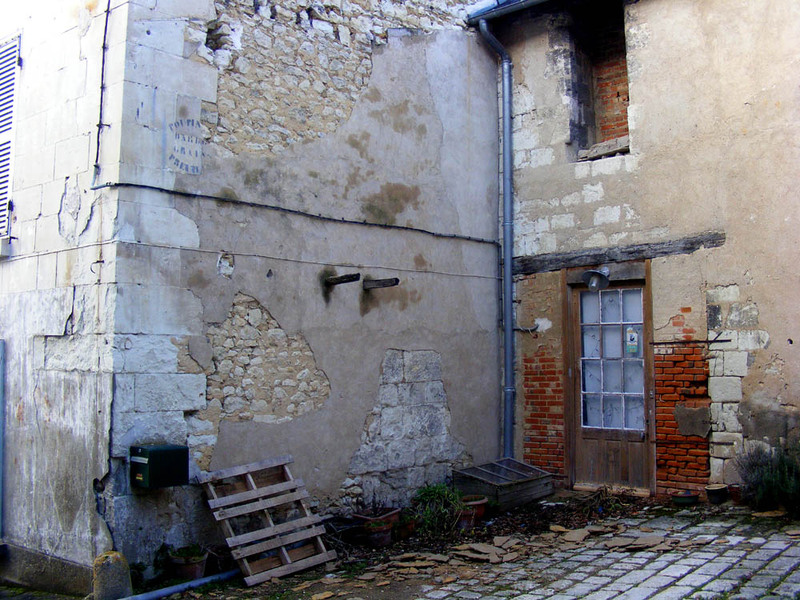 In 2013 he spent much of the year walking across France to get a feel for the mood of the population. 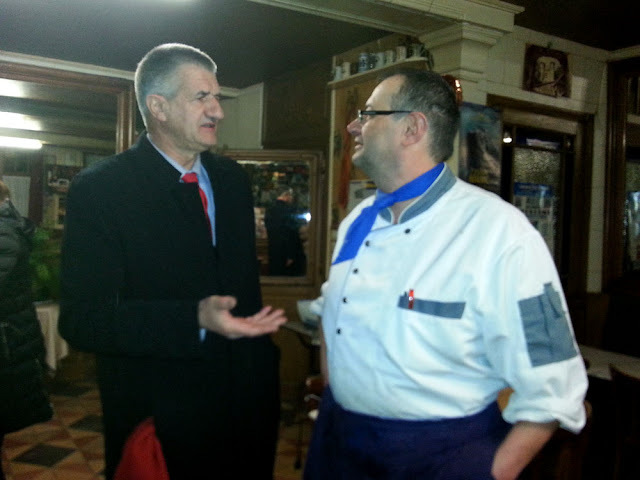 Jean Lassalle talking to Jean-Michel Chedozeau. Photo courtesy of J-M Chedozeau. Back in 2006, when a Japanese manufacturer announced the closure of their factory in the Pyrenées he went on hunger strike in protest at the loss of jobs. The company was persuaded to stay and Lassalle lost 21 kilos in weight. His genuinely 'honest broker' stance has led him to make what seem to be naive errors of judgement. Just recently his inability to adopt a slick political sidestep meant that he has stated in public that he cannot confirm that President Assad of Syria bombed his own people. Even his supporters are bemused, and it will probably cost him the candidacy and possibly his political career. He is also anti marriage for all. Despite these lapses I get the impression he is widely liked by his parliamentary colleagues and certainly known for delivering amusing speeches which reduce the house to tears of laughter. He is considered hard-working and devoted to his country, if distinctly quixotic. His manifesto, Un Berger à l'Elysée, is poetical and romantic in style. He wants to return to an idyllic world where there is no national debt, no globalisation, no French troops overseas, and European agreements are completely revised. He's not anti-Europe, but thinks considerable reform is necessary. 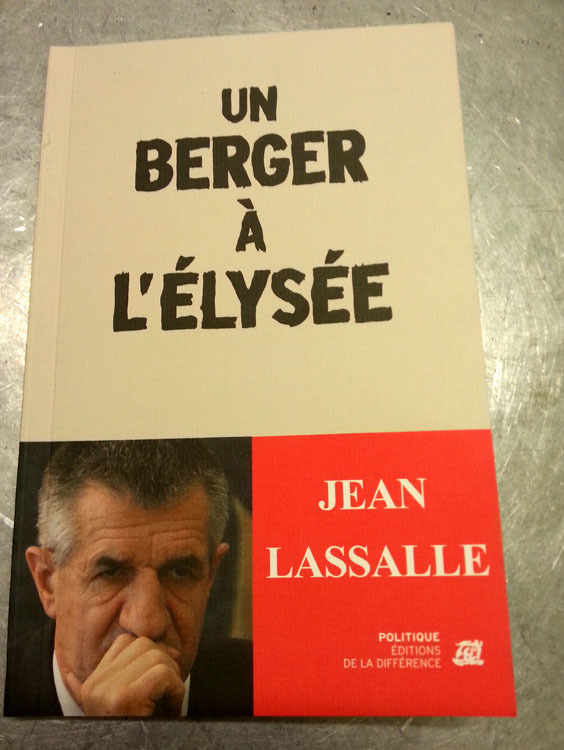 Jean Lassalle's manifesto. Photo courtesy of J-M Chedozeau. Our friends Jean-Michel and Martine are interested in Lassalle and were delighted when he dropped in to their restaurant after the meeting (which they tell me was not well attended, partly because it wasn't widely advertised). It is clear Lassalle has the common touch and a certain charisma, but even in these interesting times, no one except the man himself takes his presidential campaign seriously. Many right-minded good hearted people would no doubt like to vote for him, but to do so is worse than wasting a vote. Sadly, voting for these sorts of minor candidates in the presidential election is tantamount to giving your vote to the far right because it splits the moderate vote. I think most of my friends are going to swallow hard and vote for the centrist Emmanuel Macron, despite his lack of party machine meaning that any government he forms will necessarily be a coalition, so who knows what we'll get. 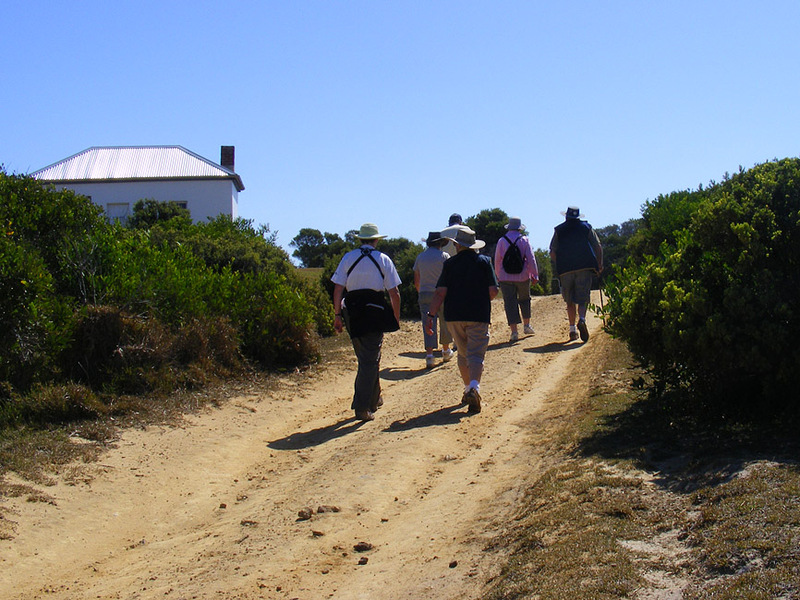 My family head out for a walk along the New South Wales coast. Our posts on Sundays have an Australian theme. If you would like to read more, click here. 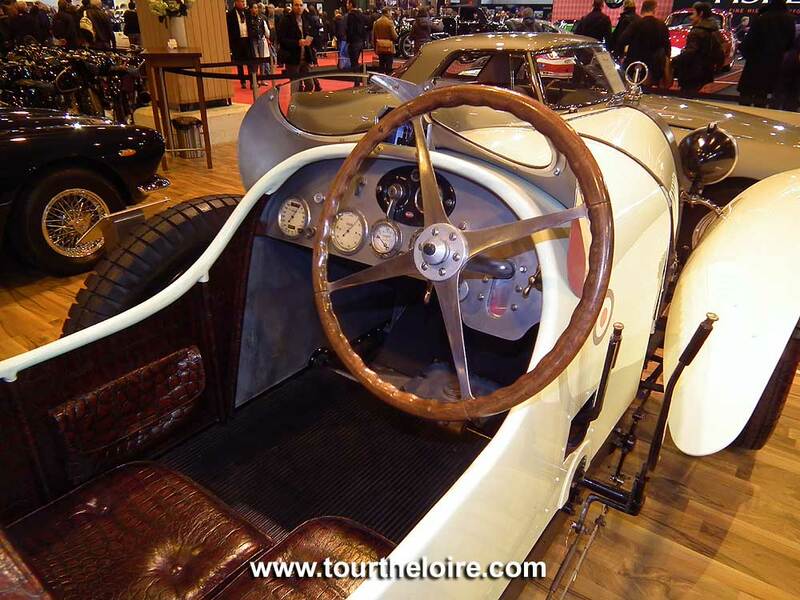 As is our wont, we went to Paris last week to do some business and to attend Retromobile. 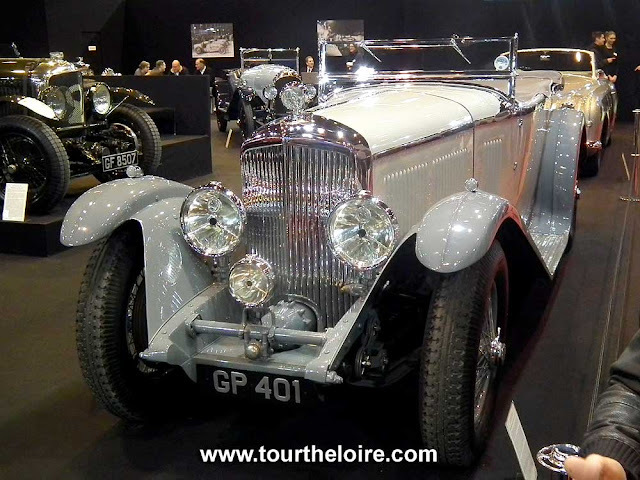 One of the car dealers had a display made up completely of Bentleys and Bugattis, which understandably attracted a lot of attention, much of it from me. I am less certain about which cars I covet the most, but these two are amongst the front runners. 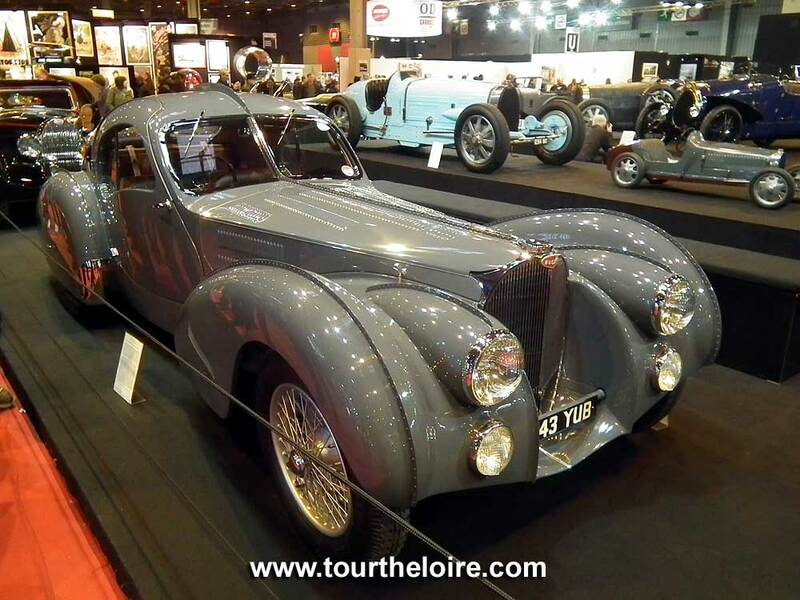 Since arriving back from Retromobile I have been a bit poorly. 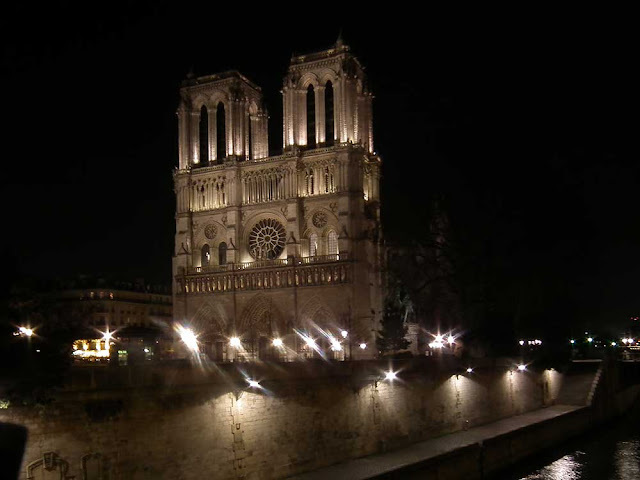 I don't know if I picked up a germ in Paris, or if it was coming back to a cold house, but for some reason on Monday I had a bit of a cough, which by Tuesday afternoon was raging bronchitis and non stop coughing. On Wednesday I admitted defeat and we made a Doctor's appointment (for the same day, of course) and after starting taking the drugs cocktail (4 prescriptions) I was instantly feeling a lot better. Today I am still feeling where it is, and if I move too quickly (not unknown...) I break out in coughs, but I am on the mend - hooray. Qui est cache derriere ce journal ? We went up to Paris on the train on 8 February. 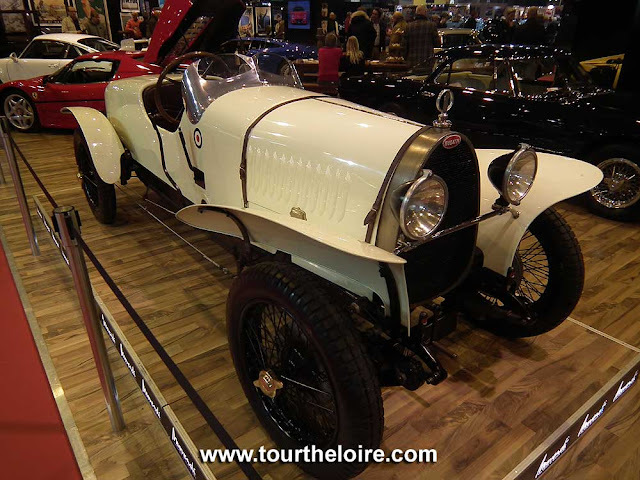 Simon needed to renew his Australian passport and the classic car show Rétromobile was on so we stayed a few days in the big city. We took the 'slow' train up, which pootles along the Loire Valley at a mere 200km per hour. This train has a number of carriages with old fashioned style compartments. We ended up in a compartment with another couple. He was reading the popular weekly satirical newspaper Le Canard enchaîné. We got chatting and I felt confident enough to ask him to pose with the newspaper so I could photograph it/him. 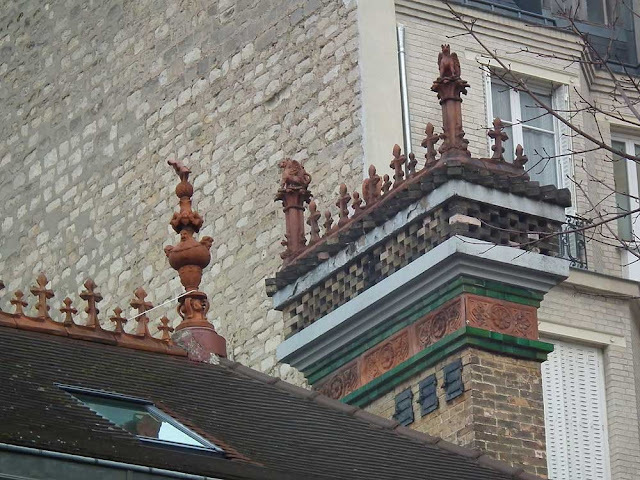 I thought it was a good opportunity to write about a paper that is a household name in France. It's the French equivalent of the British Private Eye or the American Onion. Curiously, there is no Australian equivalent that I am aware of. The edition he was reading was particularly juicy. Presidential candidate François Fillon had just informed everyone that he had done nothing wrong by paying his wife tens of thousands of euros from public funds as his 'assistant', and what's more it's nobody else's business how much he chose to pay her. He is not going to renounce his candidature so his party can just put up and shut up is his attitude. Technically, apparently, this is true, in that what he did isn't illegal, but it has shocked and disappointed the French public to the core because it sure isn't in the spirit of public service, and he has campaigned as the 'squeaky clean corruption free' candidate. The man on the train was disgusted with Fillon's behaviour, and disgusted that this sort of rort was even possible in France. He was sure it wouldn't be tolerated in Germany, Britain, wherever. 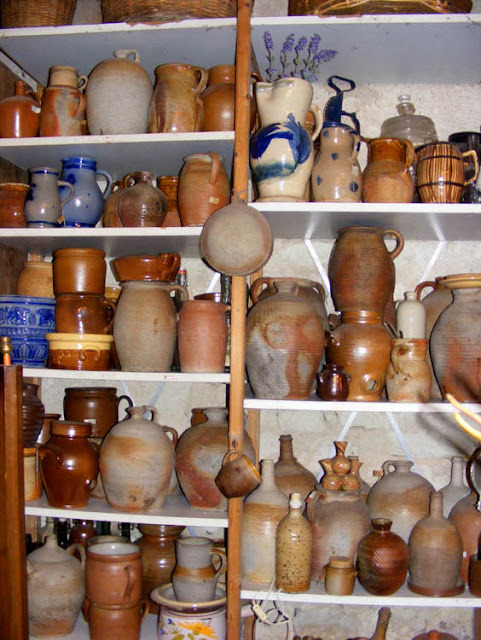 The headlines in Le Canard enchaîné say things like 'the investigators found no material indication of Penelope doing any work, but there is a record of her redundancy payment', and 'one more proof that Fillon knows how to cash in!'. 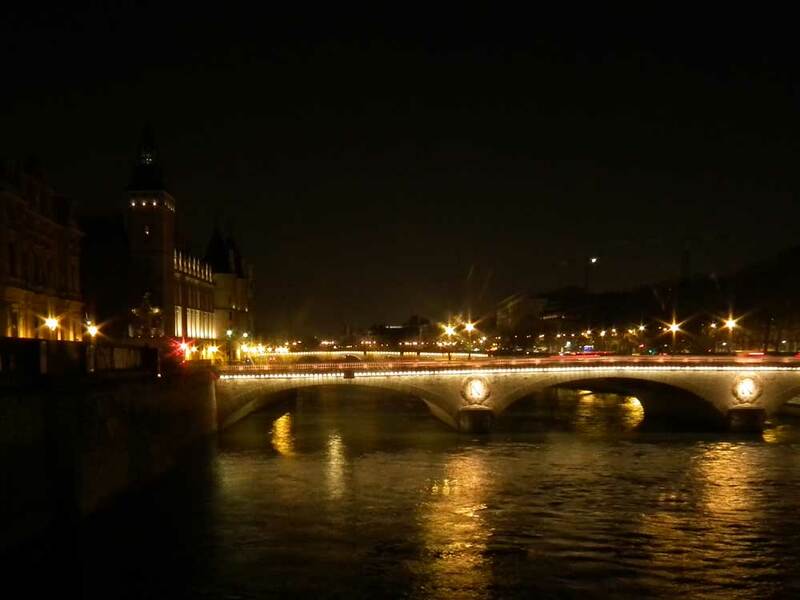 Le Canard enchaîné is based in Paris and specialises in political and business investigative journalism. It was founded in 1915 and was a direct response to the closure due to censorship laws of Georges Clemenceau's paper L'Homme Libre. The name of the paper is a clever multiple word play, which can be interpreted as 'the censored paper' or 'the inside whisper'. Today the paper is non-aligned politically, anti-clerical and anti-aristocracy. It is fully funded by subscription, features a good number of satirical cartoons, some reporting on the arts and social issues and interviews (some real, some satirical inventions). The paper does not take advertisements and is privately owned (partly by the employees). It pokes fun at anyone in public life, especially politicians, giving them nicknames and relies on anonymous sources who are clearly very well placed in government circles. 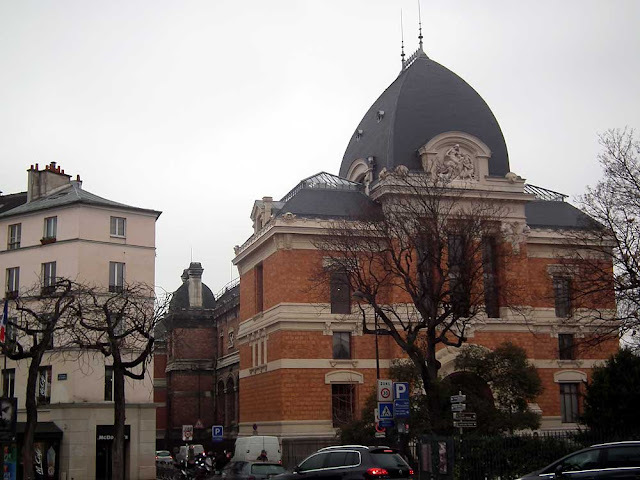 Investigations carried out by Le Canard enchaîné in the past have included details of Paris Chief of Police Maurice Papon's role in the Holocaust and corruption during Jacques Chirac's time as mayor of Paris. As a result of the way it is run it is one of the most highly regarded, widely read and influential newspapers in France. I have to admit, I don't read it. 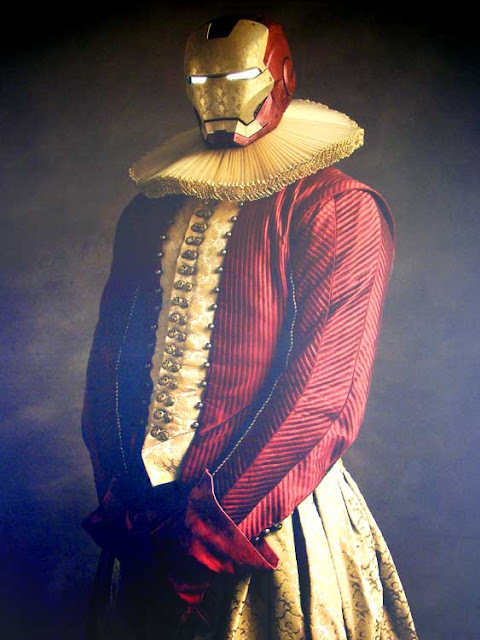 Satire is fun in small doses, but an entire newspaper devoted to the art is not my thing. Despite having immense respect for its longtime editor Ian Hislop, I didn't read Private Eye either, when we lived in England. So, who is hidden behind this paper? 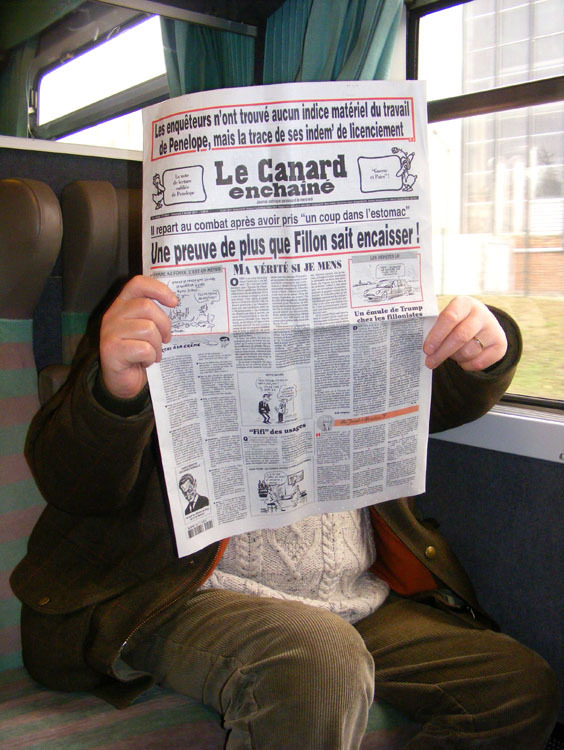 A well educated, politically aware, middle class, interested and interesting, humorous, late middle aged French man, a good sport about being photographed with his newspaper of choice, with a daughter who lives in Cirencester (England) and who was travelling to Paris on the train with his wife. He took my business card and checked out Days on the Claise on the spot! I really enjoyed meeting him and his wife and it made the train journey much more fun. In early February France was hit by a series of severe storms, with lots of high winds. The middle one, which hit on Saturday 4 February was called Tempête Leiv (tempête is the equivalent of 'cyclone'). 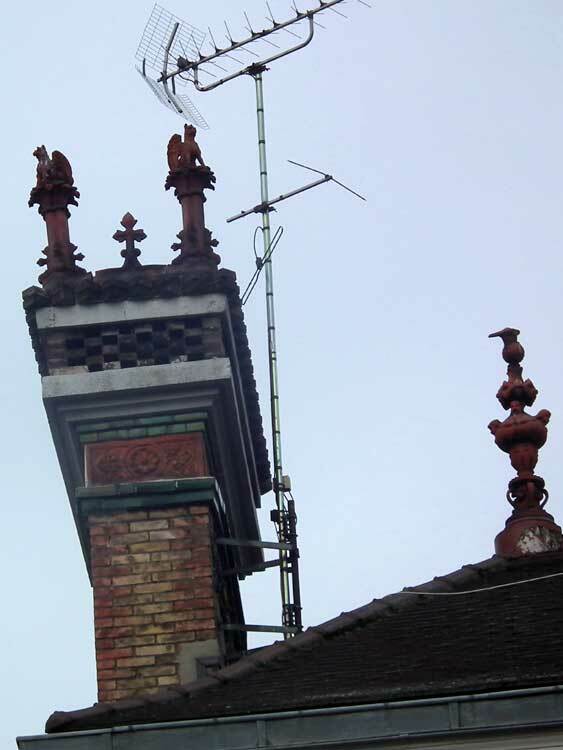 Wind speeds in some places in the south-west were recorded as 150 kilometres an hour. 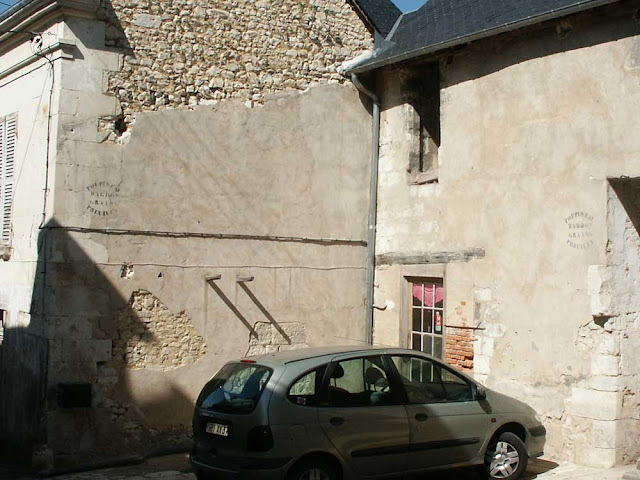 I had to go to Blois that day so I watched the weather forecasts and reports carefully the day before and only made my mind up to go at the last minute. We had an orange weather warning ('be very careful, dangerous phenomena envisaged') and I needed to leave before dawn. 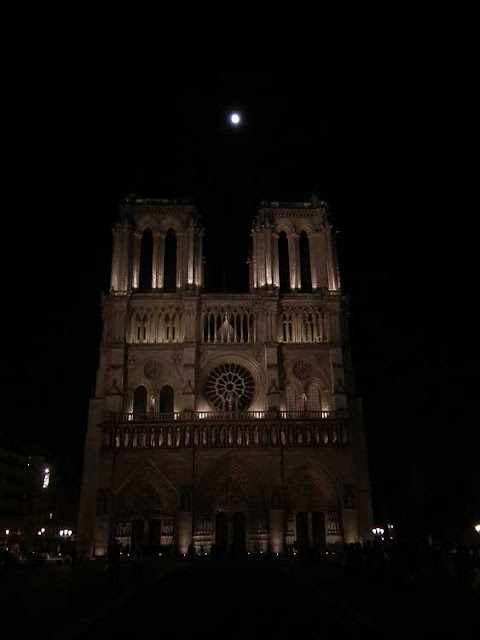 In the end I decided to go, and drove off at 6.45am, in the dark. 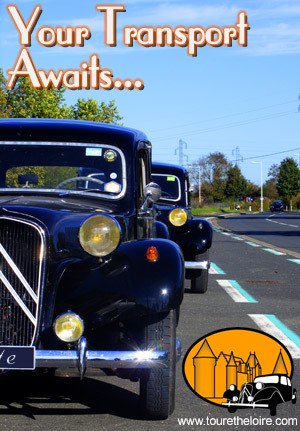 The wind turned out not to be too worrisome on the drive up, but there was a lot of water on the road, and on one occasion on the Loire levee I hit an invisible sheet of water and the car jerked in the direction of oncoming traffic. By then it was light, but I could have done without the experience. The render fell from the section above the cable that crosses horizontally. The drive home in the late afternoon was a doddle, with blue skies a lot of the way. 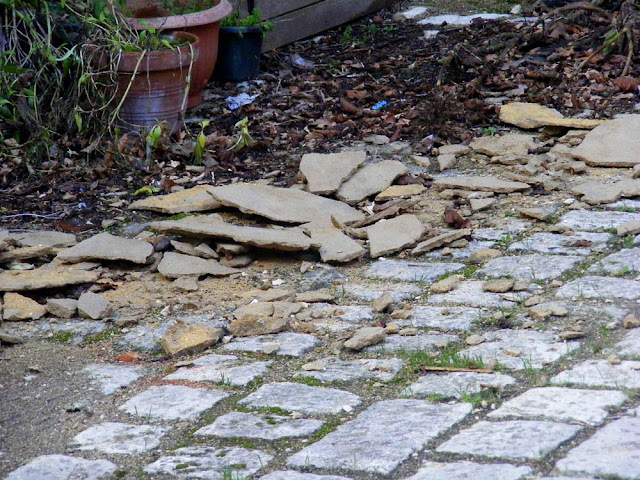 When I got home I went to turn into our courtyard and realised that there was a pile of shattered render lying where I would normally park the car. I parked the car parallel to the street instead and took photos of the debris. Simon tells me that about 3 minutes after I left there was an almighty crash. He thought it was me having forgotten something, coming in the back door and the wind catching it and slamming it. He called out to me but when there was no response decided he'd better investigate further. He went outside and looked around, but didn't notice the render on the ground (!). What it looked like several years ago. As you can see it was already a bit patchy, but the remaining render did at least appear to be attached to the wall. We are extremely lucky that I had left. If the car had still been there the render could have smashed the windscreen and certainly badly dented the roof and driver's side. If I had been sitting in the car when it happened it would have been thoroughly terrifying. Phew! 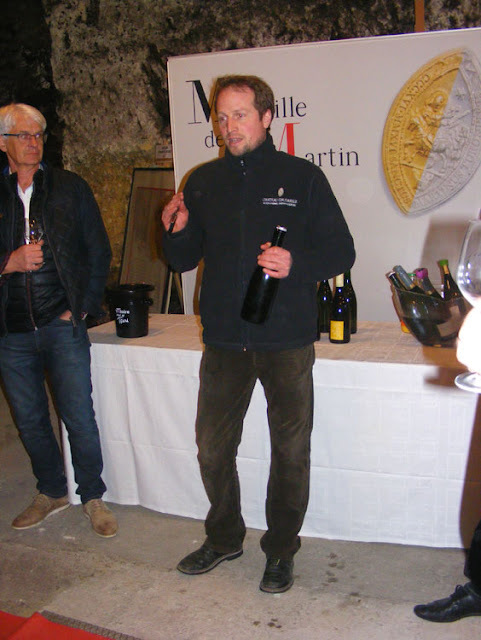 About six months ago blog reader Michel Brouard emailed me to tell me about la Grange du Rivaux at Mairé. 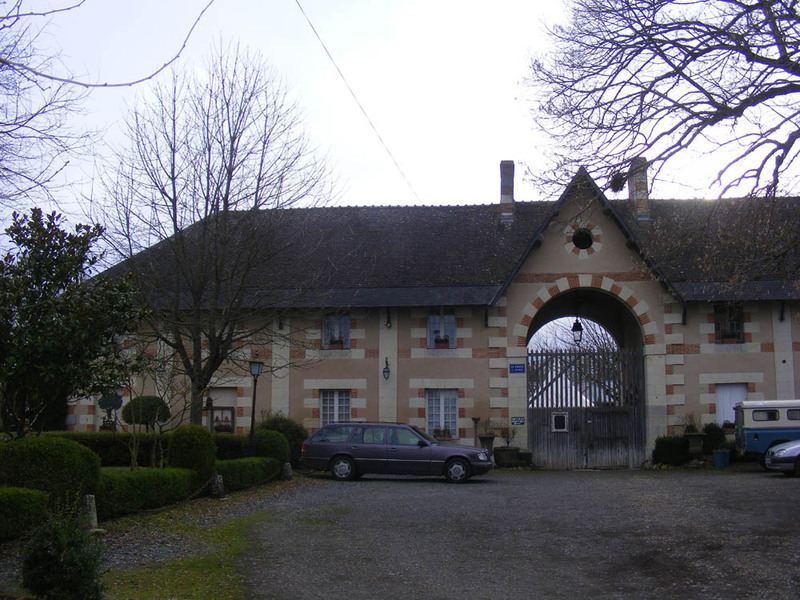 Grange means barn and this one houses a collection of antiques and brocante for sale. It's open Friday to Monday, 3pm to 7pm (Saturday to Monday in winter, 3pm to 6 pm). He also mentioned that the garden was rather quirky, and in particular there was a large wire mesh chook out the front. 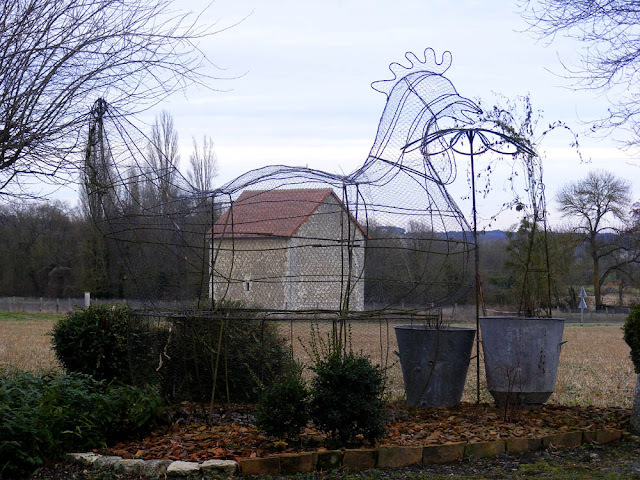 He believes it was made for the village of Chaumussay's float in the 1999 Comice d'Agricole (Agricultural Show) parade in Preuilly. 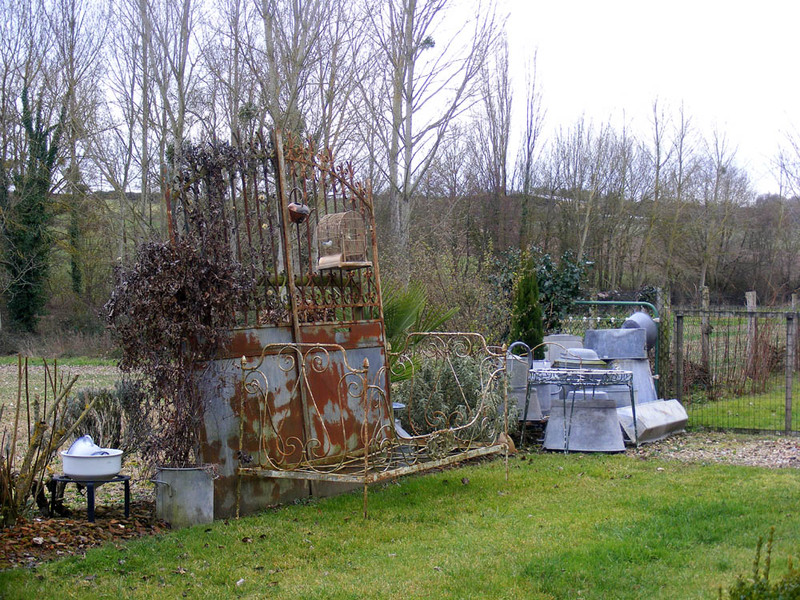 A once lovely wrought iron bed and a load of quite good glavanised tubs and troughs. 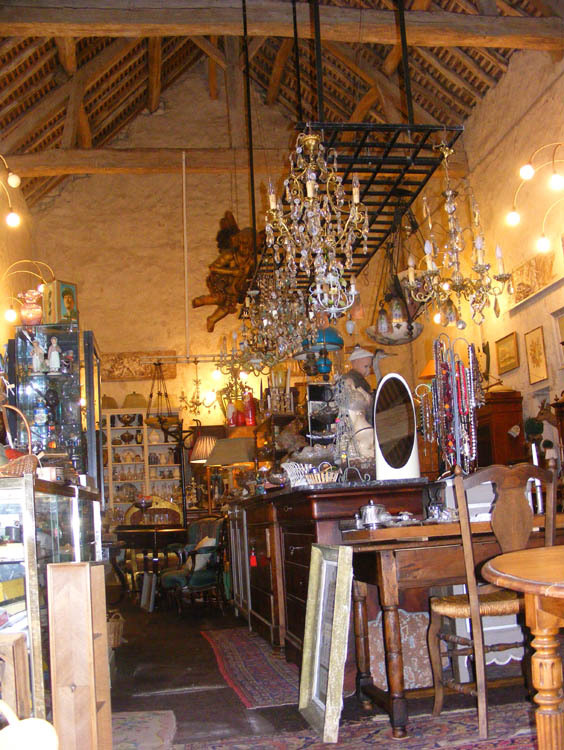 We had never been there before, although I had heard it was rather a good brocante (second-hand goods shop). The other day we happened to be passing, and had the time to call in, so we took the opportunity. View down one half of the barn. We got chatting to the woman who owns and runs the place and it turned out she knew exactly who we were. Michel had told her about us. 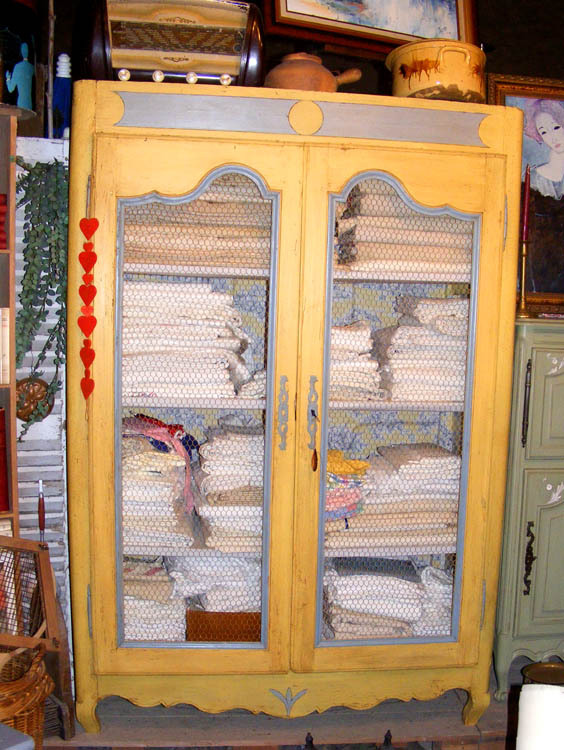 Vintage linens in an armoire. We discussed the possibility of bringing clients to visit the Grange for some French antique bargain hunting. 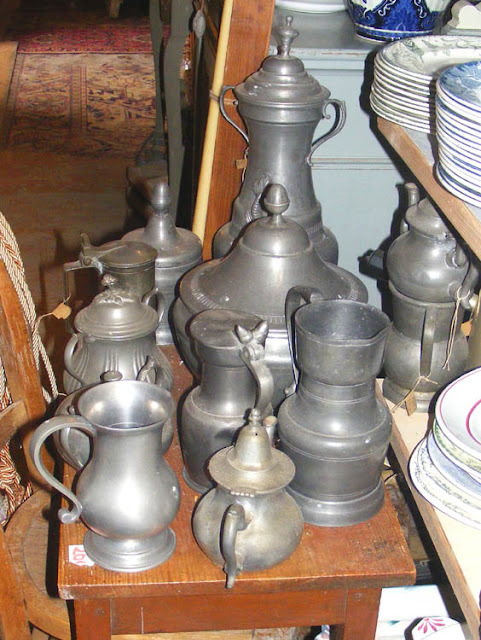 The prices and quality of the stock are both attractive and I think many people would enjoy a shopping trip into the French countryside to buy an antique or two. 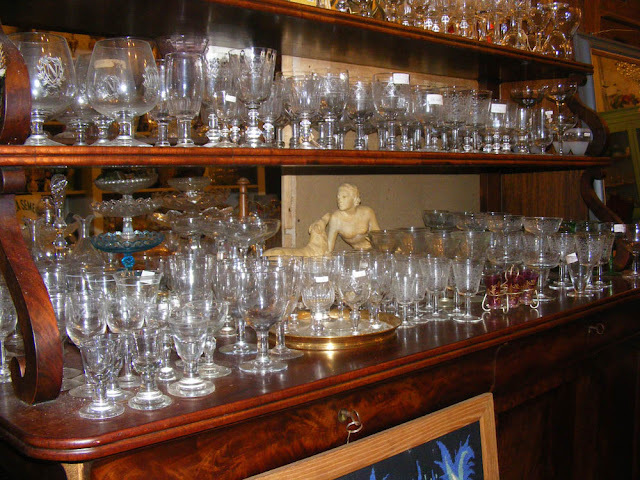 Drinking glasses on a sideboard. 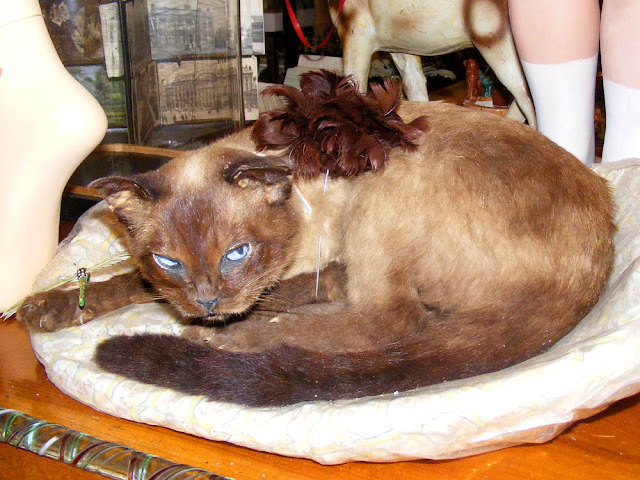 Not everything in the shop demonstrates good taste and style. 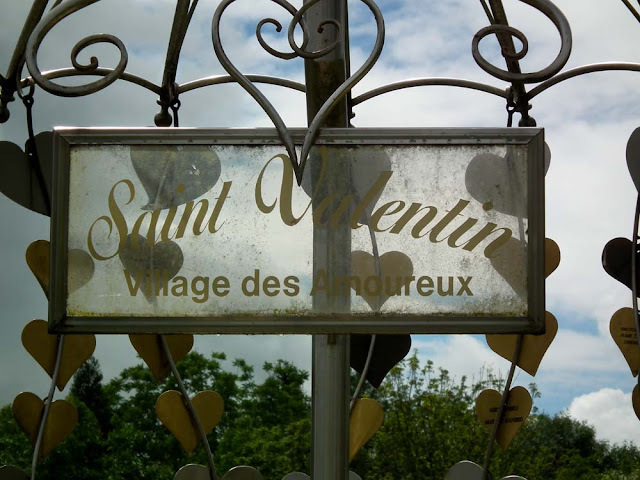 Deep in the heart of the countryside, geographically buried right at the centre of France is the aptly named Saint-Valentin, a tiny village of just 300 souls. A metal tree from which couples can hang engraved hearts dedicated to their love. Somehow it has forged a connection with a Japanese Buddhist temple dedicated to love and peace and the town of Saint-Amour in the Jura moutains. Between them they have created a celebration of the festival of Saint Valentine. 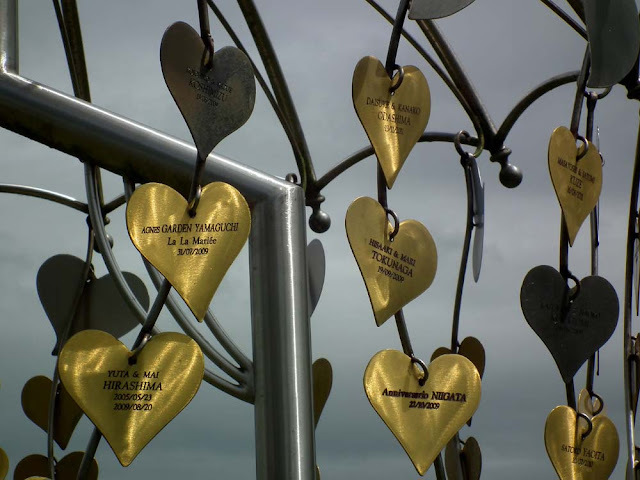 Dozens of couples come every year to have their wedding vows affirmed and commemorate the occasion by hanging an engraved heart in the Jardin des amoureux ('lovers' garden'). A Japanese chef heads up the team at the local restaurant Au 14 février and it is the only Michelin starred establishment in the département of Indre. When the Post Office issued a special Saint Valentine's Day stamp designed by Raymond Peynet, it was at Saint Valentin where the first day covers were released. The artist, who had become famous for his cute cartoonish drawings of Les Amoureux ('lovers') and is big in Japan donated a drawing to the town every year from 1985 to his death in 1999 (obituary in English here). 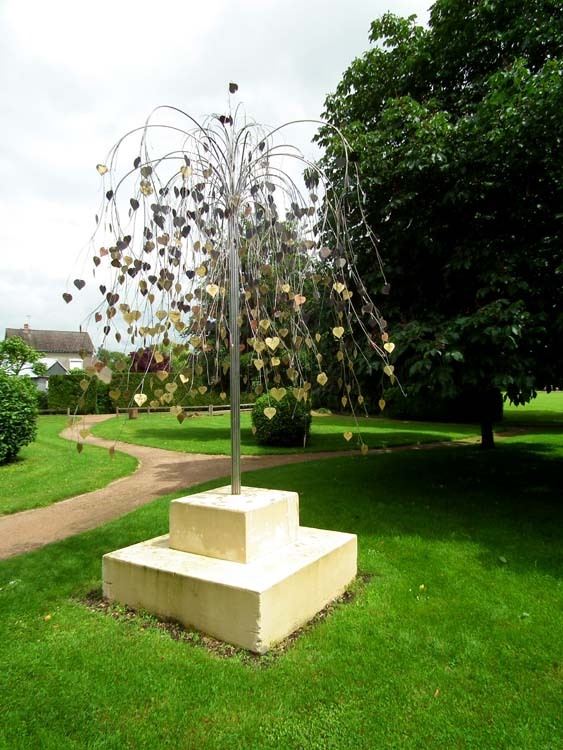 Love hearts on the metal tree in the Lovers Garden. I am continually astonished by how rich and varied the old province of Berry is, how many bizarrely unexpected things one encounters there. On the surface it seems like a complete backwater, with its big horizons, endless rolling grain farms and secretive swamps. Who would have guessed that a village which, in the words of the mayor himself, was not the home of anyone famous, doesn't have a historic building, isn't by the sea, isn't in the mountains -- in fact, a commonplace little village that sits isolated in the boring Berry plains -- could have carved an identity out for itself in such an extraordinary way?